Heat oven to 350°F. Bake biscuits as directed on can. Cool. Meanwhile, in small bowl, mix peanut butter, 1 tablespoon of the soy sauce, 2 tablespoons of the chili sauce, lime peel, lime juice and 1/4 cup water. Set aside. In food processor, place 2 biscuits. Cover; process 15 to 20 seconds with on-and-off pulses or until consistency of bread crumbs. In large bowl, mix bread crumbs, turkey, remaining 2 tablespoons soy sauce, remaining 2 tablespoons chili sauce and 1/8 teaspoon pepper. Shape mixture into 6 patties, 4 inches in diameter. In 12-inch nonstick skillet, cook patties over medium heat 6 to 10 minutes, turning 2 to 3 times, or until meat thermometer inserted in center of patties reads 165°F. Meanwhile, microwave frozen spinach as directed on box. Cool slightly; squeeze to drain. In small bowl, mix spinach, 1/4 teaspoon salt and 1/8 teaspoon pepper. Split 6 remaining biscuits; spread 1 tablespoon peanut sauce on bottom of each biscuit. 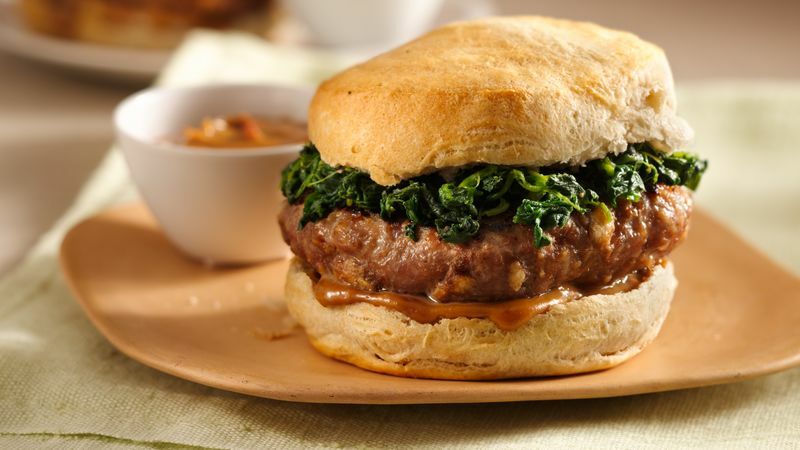 Top with burger, spinach and biscuit tops. Serve with remaining sauce.